We Sakshi International Private Limited are a leading manufacturer, exporter, supplier and wholesaler of printed fabrics and bed sheets. In this range our valuable clients can avail Hand Block Printed Fabric, Hand Block Printed Bed Sheet and Home Furnishing products have earned us a good name in the national and international upholstery market, due to the highly regarded innovative designs and the proved sustainability. We have been growing with leaps and bounds even in the times of deviating hurdles and curves in the path of upholstery market. Our hand block printed fabric and curtains are very commonly used in homes and hotels, owing to the good fiber content, superb fiber construction, optimal weight of the fiber and unfading color and print. Our fabric is perfectly dyed and colored to achieve the desired color fastness. Additionally, our innovative computer generated printing designs add value to the grace and finish of the fabric. We also ensure that the fiber to be printed should be constructed from the best available yarn which is intertwined and intermeshed with each other to give a characteristic appealing look and feel. We are known in the industry for long-term and mutually beneficial relationships which is the reason behind our huge clientele base across the globe. We are very proud of our mentor Mrs Bhagwati Kumawat who has always extended his helping hand to us, whenever we were in need. Her guiding principles have always shown us the correct path and have helped us mustering a vast clientele all across the globe. We are empowered with a highly dynamic professionals having good relevant technical qualification and know the textile industry like the back of their hands. We possess a highly responsible, diligent and creative team of professionals, which are committed towards promoting the excellent organization’s interest. Our team encompasses designers, production experts, quality controllers, warehousing & packaging personnel’s. The technically oriented sales force works in close coordination with the clients and are at disposal of our customers all times to develop long lasting alliances with our customers. A well planned and well knit infrastructure forms the backbone of our business process. Structured in-house units with standardized work procedures to follow, helps us to stick to deadlines perpetually. Apart from our highly equipped production units, we also possess quality control department, R&D department for flawless production. This enables us to meet timely-dispatches and quality standards. We utilize sophisticated machinery and processing methods to meet the customized requirements of our customers. All departments work in close coordination to deliver quality apparels in stipulated time frame. We offer a wide range of printed fabrics that enhance the beauty and are available with perfect design and finish to refine fashion statement. Quality and service are our hallmark. Our printed fabrics are a mélange of style, utility and comfort. 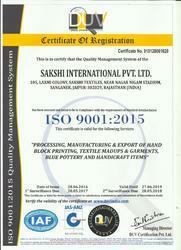 Our fabrics are made under stringent manufacturing process. We have a strong infrastructure and workforce. We offer customized products for bulk orders. We strategically plan our manufacturing process to meet with the stipulated time frame. We offer easy payment modes. 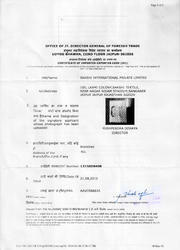 We are certified under certificate of Importer-Exporter code ( IEC ). We strongly believe that quality is the expression of our printed fabrics. Quality is almost fetish and it is our philosophy to use natural materials and promote latest fashion trends with the support of commercialization. Our products are quality checked at every stage manually and technically to give you a guarantee until the selling in stores. Quality is emphasized in all the procedures and We follow many strict quality standards to ensure that the clothing We manufacture is in line with the taste and requirements of our buyers.